Good breakfast and free internet. I would stay here again. 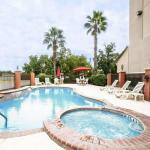 Nice hotel for the price and good location for this part of Houston. Noting real fancy but clean and comfortable. Clean, convenient, friendly staff, business room computers and printers worked. Only 1 guest laundry facility, hot tub was never "hot". The 64-room Comfort Suites Willowbrook/Technology Corridor is across from the Hewlett Packard technology center and provides quality accommodation at an affordable price for both the business and pleasure traveler. Items included with the room rate at this non-smoking hotel are a hot breakfast buffet, a managers reception on Tuesday evenings, wired and wireless Internet access, local telephone calls, a copy of USA Today, parking and coffee available in the lobby 24/7. Area landmarks and attractions include the Methodist Hospital, Sam Houston Race Track, the Houston Silverado IMAX all-digital movie theater, the Space Center Houston, Bayou Place entertainment complex, the George R. Brown Convention Center, Six Flags theme park and shopping at the nearby Willowbrook Mall. All the suites have a work desk with high-speed Internet access, television with cable movie and news channels, refrigerator, microwave oven, tea and coffee making facilities, sofa sleeper, iron and ironing board and a hairdryer. Handicap accessible rooms are available. This hotel has an outdoor swimming pool, hot tub and a fitness center. The complimentary breakfast is the only meal served here. Restaurants nearby include a Chilis, Romanos Macaroni Grill, an Olive Garden, Spaghetti Warehouse and a TGI Fridays. The 24-hour front desk has information on area events and attractions. Other amenities include a business center with copy and fax machines available for guest use, daily housekeeping and ice and vending machines. Many visitors to Houston who stayed at this Comfort Suites loved this hotel saying it was in a quiet location but with easy access to the highway. The rates were reasonable for the clean, comfortable and well equipped rooms. The managers reception on Tuesday evenings was an unexpected bonus for several clients who said this would be their hotel of choice on future visits to the area. The efficient and friendly team of employees got top marks for their efforts.